Have you ever eaten a dessert made with lentils?! Sweetened lentils are the star of this simple sweet dish! This moong dal payasam is made with small yellow lentils, jaggery, cardamom and coconut milk! 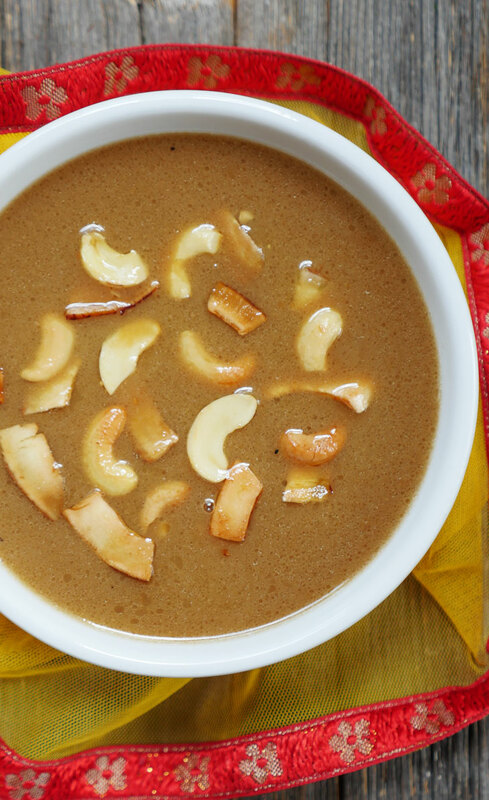 This Kerala style moong dal payasam is sweet, creamy and absolutely delicious! Moong dal payasam is basically the south Indian version of kheer but instead of rice we’re using small yellow lentils and instead of milk, we’re using coconut milk! The name of the South Indian state of Kerala translates to “the land of coconut trees,” and so it’s no surprise that this traditional moong dal payasam calls for coconut milk. There, they use fresh coconut milk, but for simplicity’s sake, my recipe calls for canned coconut milk. 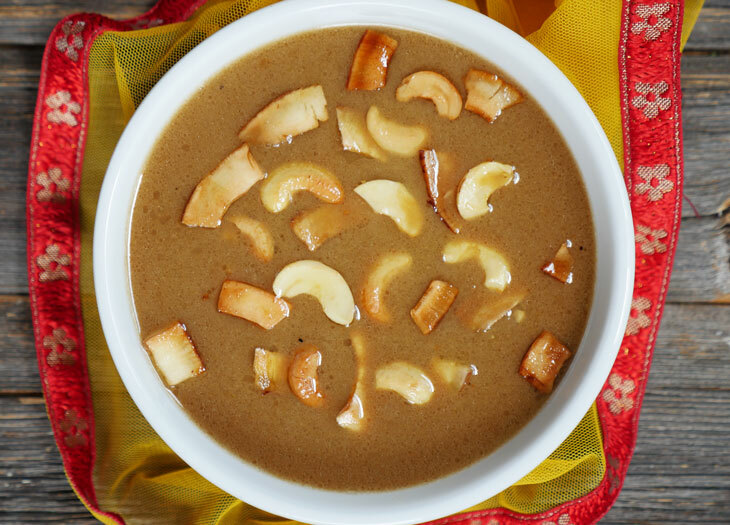 This moong dal payasam goes by several different names. It’s also known as parippu payasam or moong dal ki kheer. It’s a special dessert often served during the Onam festival (I talk a bit about this festival in my avial blog post). You can of course serve this any time and for any reason! 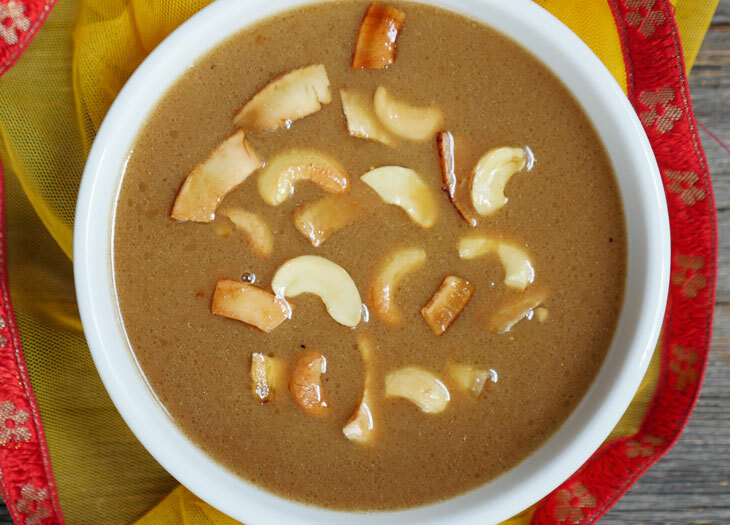 My recipe calls for roasting the moong dal in the instant pot – it adds such a nice nutty flavor and aroma to the payasam. I also suggest sautéing cashews and pieces of coconut in ghee then adding it at the end. It gives the creamy kheer a nice crunch and adds flavor too. You can find frozen coconut pieces from your local Indian grocery store. With coconut being so popular these days, you might even be able to find them at your regular grocery store – I think I’ve even seen them at Trader Joe’s! This isn’t a healthy dessert but I will admit, I feel a little better about eating a dessert made with lentils. My Keralite husband, Roby, doesn’t typically eat sweets but when he does – he likes them SWEET. That’s why we almost always end up adding a full cup of jaggery to this paysam, but feel free to adapt this dessert to your taste. You can also use coconut sugar or brown sugar if you don’t have jaggery on hand – I do love the taste of jaggery though. If you make this dessert, leave a comment letting me know what you think! Have you ever made dessert with lentils? I think you’re going to love it! Sweetened lentils are the star of this simple dessert. The name of the South Indian state of Kerala translates to “the land of coconut trees,” and so it’s no surprise that this traditional moong dal payasam calls for coconut milk. There, they use fresh coconut milk of course, but for simplicity’s sake, my recipe calls for canned coconut milk. If you’ve ever had kheer before, then you’ll find that this is a similar dessert, but made with lentils instead of rice and coconut milk instead of milk. 1 cup jaggery or coconut sugar, adjust to taste! Press the sauté button. Add the small yellow lentils (moong dal). Dry roast the dal for 2-3 minutes, or until it turns golden and gives off a slightly nutty aroma. Remove the lentils and rinse them under cold water. Press the sauté button. Add ghee to the pot. Once it melts, add the cashews and coconut pieces. Stir-fry until golden. Remove and set aside. Add the rinsed lentils back into the pot along with 1 ¼ cups water. Secure the lid, close the pressure valve and cook for 12 minutes at high pressure. Mash the lentils with a ladle, then press the sauté button, add the jaggery and cardamom and mix well. Pour in the coconut milk and stir until well combined. Cook for 2-3 minutes, or until it thickens a bit. Serve warm or cold and garnish with the ghee coated cashews and coconut pieces. *Find frozen coconut slices at your local Indian grocery store. Thanks for the recipe. It turned out very well! I added a teaspoon of Dried Ginger powder too because I have seen it in other traditional recipes. Next time I might add a little more moong dal to make it thicker. Abey, I’m so happy to hear that you made and liked it! Thank you for letting me know how it turned out for you 🙂 Love that you added dried ginger powder – yum! Oh My God, I love moong dal payasam. Tried it and it turned out perfectly. I could eat the whole bowl and claim it’s healthy, but I’ll try to refrain. Added ginger powder too! Lygia, that’s awesome!! I’m so happy to hear that 🙂 Thanks for letting me know how it turned out for you! Love this delicacy. And love this recipe. So simple, straight forward and tasty. Tried it today and everyone in the family lapped it up. Thanks.